This week’s blog post is a work-in-progress version of the story I will tell at Story SlamMN on April 1st at Kieran’s Irish Pub, the theme being “courageous.” The word is barely touched on in this story, but it is where my meditations on the concept of courage have led so far. Right now it’s about 150 words too long. Feedback is welcome. My daughter Maggie and I spent this past Christmas together in Chicago, where she is finishing up a graduate degree. Aidan works in retail, so for him doing anything around the holidays was impossible. But when Maggie was done hosting her mother for Christmas – a first for us both – we got on a plane at Midway, and then, after a stop in Detroit, we landed at Elmira Corning Regional Airport, “serving the Southern Tier of Central New York and Northern Tier of Central Pennsylvania since 1945.” Probably with the same planes. Or should I say Greyhounds with propellers. “If she stumbles on your name…” I say, as we head up the ramp. My mother doesn’t stumble on Maggie’s name. She looks almost normal. She hugs just the same. My sister warned me she might cry, but she doesn’t. The first evening, after the dinner at Cracker Barrel – my dad wanted to take us to a chain restaurant they hadn’t taken us to yet – Maggie and I help with the puzzle. It has five hundred pieces, and it has been on the dining room table for over a month. “All the birds,” says my mother. “Yeah, but they’re in all those leaves!” says my father. My dad needs a magnifying glass to tell his fours from his nines, and all the puzzle pieces look the same. It’s the macular degeneration. My mom has a disease we don’t name, though my dad will occasionally refer to her “memory issues” and the problems she has “getting her words out.” It’s like her mouth has become a vending machine, and the words get caught in the spirals. She used to be able to tell all the birds apart: the cardinals, the waxwings, the bluejays. She can still with some. But soon they’ll all be birds, like the leaves are all leaves. My father brings out a box of chocolates. “We need to finish this puzzle, and we need to finish these chocolates,” he says. “In this house, we finish what we start.” My parents built that house, and my father has always said the only way he’s leaving it is if he’s carried out in a box. Maggie sits at the head of the table, my mom across from her. They are the north and south poles, my dad and I are east and west. Across the vast plain between us is the puzzle. I’ve never been good at puzzles. At least not the spatial kind. My puzzles have always been around getting the words right, getting the images right, witnessing to the texture and complexity of human experience, getting the story down. Now I am trying to look at what happens when a person stops being able to do that. But it takes courage. Often I’d rather make up my own story. Sometimes I do. My mom picks up one puzzle piece after another and tries them out, then puts them back. I am reminded of my eighth grade self playing softball, pretending to guard the outfield. Going through the motions. Trying to fit in. When Maggie has success, both grandparents cheer her on. “Thank God for Maggie!” my father says. “Thank God for Maggie, or we’d never get done,” says my mother. Once or twice Maggie finds a piece or two in my mother’s pile – “do you think that goes over there?” and my mother is as delighted to fit those pieces in as if she had found them herself. And then, the pump having been primed, she does find a few. My father decides it is time for his bath. I sit with my back to the rows and rows of books on shelves that line one side of the room, as if it were a library. All my mother’s. My dad believes in reading the news and the comics, though both are hard for him now. But he wanted to show off all the books my mother had read, so he had the bookcases built. My mother’s summers as a school teacher were filled with books; my own summer reading list was always hers from two years’ back. When they retired, and the traveling began, my father’s souvenirs were always magnets; my mother’s, books. When they stopped traveling, the books were her travels. She pretends not to hear me. I pretend not to hear her, too. I could really sense the mixture of joy and sadness at your spending time together in this piece. Especially moving after you commented about your mother’s bookshelves on my blog post. I’m planning a post on dementia at the moment and will link to this. Good luck with the reading. Thanks so much, Anne! I will look forward to that post. This brought a sting of tears to my eyes, this cycle we all go through yet none of us knows how we’ll do until the test arrives. It takes courage, indeed. One of the strongest lines is, “It’s like her mouth has become a vending machine, and the words get caught in the spirals.” I think that’s where the story gets sharp and focused. The beginning is a bit slow–I understand trying to put it in context, but maybe that’s where you can eliminate (or tighten) those 150 words. I love Kieran’s Pub and if I still lived in Minne I’d be there to cheer you on. Funny, too, reading “Elmira Airport” when my Elmira is nothing but pond and horse pastures. Good luck with the reading! You’ve got a great story crafted! THANK you, Charli! I think you may be right about the beginning. I’m still not used to having so little time to work things over. Although there are many people who write on top of full time jobs, I’m a very slow processor, and I like to take my time revising. Blogging is forcing me to learn some new skills. I wonder if you know that Kieran’s moved a couple of years ago; it’s in the infamous Block E now. Inside, though, it’s still the same. Thanks so much, Crystal! And read it I probably will, though the best stories, I find, are the ones I tell without paper between me and the audience. Lately I just don’t have time for that part of the process, but I’m grateful to have energy left for writing outside of the day jobs. What a moving blog! 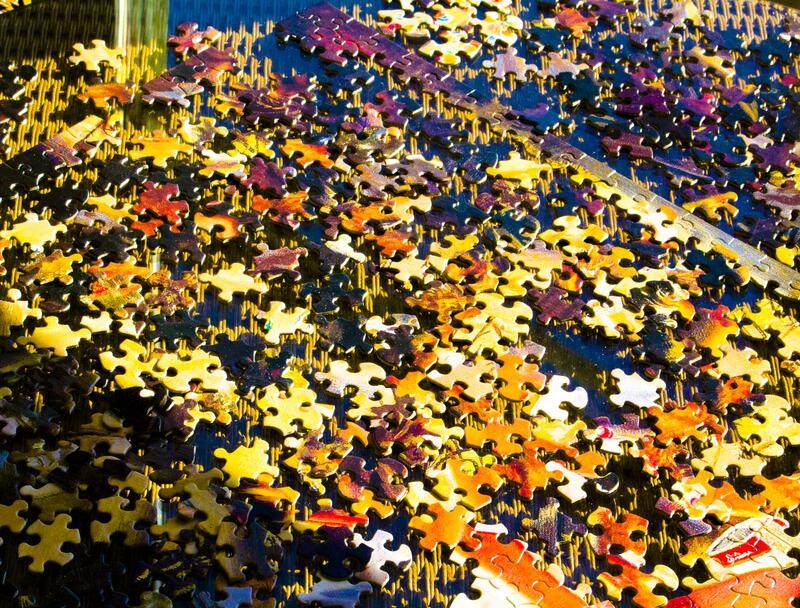 Life can be one big puzzle! Thank you, Beth. That it can. Reblogged this on Beezz Academy. Very moving piece, Paula; the tone is quite a poignant one. Your account zoomed(!) me back into memories with my mom. Dancing with any form of dementia, at any level, is tough. Funny, my most peaceful times during mother-sitting came while doing jigsaw puzzles as my mom read to me – in garbled language – from The Bobbsey Twins. We were both so content at that time. You got me, deeply moved, when I read, first: she pretends not to hear me. Then, I pretend not to hear her, too. I have no doubt that you’ll find your way into editing out those 150 words. Thank you, Doreen. I did, in fact, get that 150 out, and the story won second place at the slam. Because this is a blog about writing practice and performance, I’ll probably end up posting the second version, either in written form or as performed, and discussing the process of making those changes. It is interesting that the book my mom enjoyed best most recently was one we read at the same time, 1000 miles apart – A Tree Grows in Brooklyn. Which (sigh) is very much about reading and writing stories. My recently-passed grandmother suffered from dementia, and while we miss her greatly we were all somewhat thankful that she left this world with her mind still intact enough to know who we were. Dementia and Alzheimer’s are often hereditary, and one of the greatest fears of my life is that I will someday be diagnosed the same way. The thought of one day never reading again, something I’ve loved all my life, is gut-wrenching. Yes, my mother’s mother had it too, and the genetic implications are not lost on me. One of the most difficult things about this is that she knows quite intimately what is happening to her. The second most difficult thing, possibly, is putting my own fear aside to pay complete attention to where she is and what she needs from me now. I don’t think my grandma always understood was what happening, which often made it harder when she got angry about something because she couldn’t follow a sequence of thoughts about it. It was hard for me to be there with her as a granddaughter, so I can only imagine the difficulty of being there as a daughter. A wise woman once told me that mental diseases such as these often hurt the family far more than the individual, and I definitely agree with her. Sending strength and courage your way my friend, and thank you for sharing your struggles with the world. I’m not sure my parents would thank me, Krystal, but it’s the way I process experience and try to find meaning in it, and it seems to be helpful to others. Thank you for taking the time to respond, and keeping reading your heart out. Thank you Lara. I’m glad you enjoyed it. Sam that is very kind of you, but I’ve already been nominated for the Liebster Award by another blogger, the lovely Nillu Nasser Stelter (http://nillunasserstelter.com/) and am already committed to answering her questions. I am, however, looking forward to reading your blog. It was very nice to read. I hope you all keep meeting more often. Ha ha. I hope not too. Thank you for stopping by, Mishra. This was beautiful and inspiring. I have a family member battling with dementia so this really hit home with me. Thank you so much for writing this. Thank you for reading it, Paige, and for taking the time to tell me what it meant to you. Thanks so much for sharing this beautifully written, loving, poignant post. It brings me back to times well spent with my late parents ~ times when my father had ‘memory issues’ and my mother was physically frail but still full of poetry and hope. In a strange way, they were the best of times and what I would give to be able to spend time with them again now. I know what you mean, Jean. My parents and I have had a lot of conflict over the years – my dad and I in particular. When you see that all too soon there will be no opportunity even for friction, it puts a lot of things in perspective. I am trying to make each moment count. Thanks for stopping by. All good wishes and remember that there can be very precious moments right to the very end. Its funny (weird), now I’m old, I fear dementia, more than death. Not for me, but for those around me. Thank you, Mike. Alzheimer’s is the second most feared disease after cancer. For some of us I think it’s a toss-up. Not that we get to choose, do we? Thank you, ma’am. (What do you prefer – Vic? Vicky? Victoria?) A week from today I’ll be visiting there, and I hear my sister bought them another 500 piecer. I wish my daughter were coming with. ;-) Thank you for reading and commenting on all of us. That’s quite a generous act in itself. Oh, that hurt. It reminds me of my own mother. That was a beautifully written piece. There were times with my mom that we just had to laugh though. Hubs and I were watching a 60 minute thing about a woman who’s job is only to train for the Boston marathon. At one point she said that when her legs start getting fatigued she talks to them. Rick and I just looked at each other and had to grin. Mom used to talk to her legs like they were people. She would pat her leg and ask if it wanted coffee. So…there were moments……sometimes you just have the option of either laughing or crying and you just have to make a choice. Thank you, Norah. That’s very kind. There’s an update to that story coming soon. Usually WordPress notifies me when someone links to a post, but I may have been too busy this week to see the email – I will have to check Anne’s blog out. I think WordPress may only do that with WordPress blogs and Anne is not with WordPress. I look forward to the update. I hope I don’t miss it as I am on holidays at the moment. This is so moving Paula…. i’ve read it before..it bought tears to my eyes then, and has again this evening. I’m not sure why I never commented on it the first time round..perhaps I planned to come back and then, well, you know. You paint such a beautiful scene, of family, love, togetherness, understanding, compassion – the sadness is the Elephant in the room, so to speak, the rest is bigger than the Elephant! Bless you and yours my friend – your warmth, and theirs, shines through! That was a lovely read although touching and a little sad. I guess all of us can relate to the ageing process one way or another. Well deserved on getting freshly pressed. Thank you, Donna. That’s much appreciated.